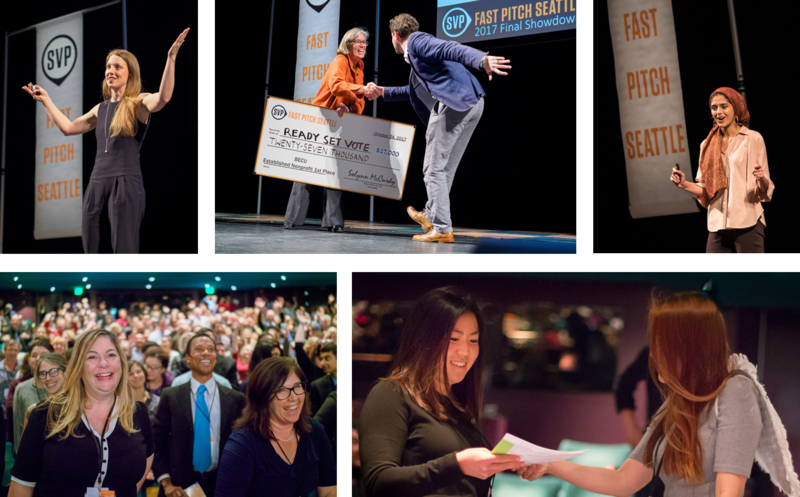 BridgeCare took home 1st Place this year in the For-Profit Impact Company category of the 7th annual SVP Fast Pitch competition held in Seattle. We faced very worthy and impressive competition from the other Fast Pitch Finalists, selected in early October to compete in the grand finale. The level of excellence in pitches across every category was unparalleled thanks to the mentorship and coaching from seasoned SVP volunteers. Our hats off to everyone that competed and, more importantly, that work hard to have a positive impact on our world every day! Social Ventures Partners is a philanthropic organization that strives to "help build thriving, sustainable and just communities for all". SVP Fast Pitch is just one of their many initiatives to find and promote startups and established organizations, like BridgeCare, and "take their vital work – for kids, for families, for the environment – to the next level". We're extremely proud to have been selected for the honor, but we also want to call attention to the other great finalists that competed with us. They are all doing great work, and we can't wait to see what comes next for these dynamic organizations. Here's a run down of everyone that shared the stage with us. The world’s first pre-hospital treatment of emergencies leading to amputation. "We are developing an autonomous surveillance system for wildfire firefighting, allowing real-time mapping of the wildfire and local terrain, and providing vital live stream information to incident commanders." "A clothing line Inspired by friendships with Washington’s refugee community, Adi Collective was created to harness the tenacious spirit and creative skills of refugee women. The name Âdi Co. comes from the Persian word for ordinary – عادی. Our vision is to cherish and connect the ordinary women of our communities with one another through our collection – whether making or wearing these pieces." Partners with area community colleges to offer coding and web development training, support and opportunity for students in the WA state prison system. "For 20 years, Art with Heart has been on a mission to help children overcome trauma through creative expression. We are the nonprofit organization behindOodles of Doodles,Chill & Spilland other evidence-based, therapeutic books and programs that help children struggling through illness, divorce, violence, or the loss of someone important to them." "The easiest, fastest way to decide how you will vote. Create a personalized ballot guide and view recommendations from sources that you trust. You’ll be ready to vote quickly, easily and with total confidence." What is SVP Fast Pitch? See a recap of all with finalists and awards.